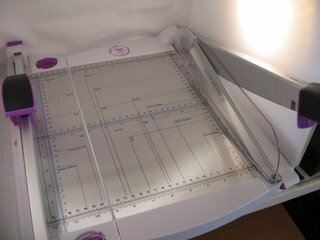 To save you time with your card making invest in a good paper trimmer. There are lots of them to choose from and they don't have to cost the earth. Shop around to get the best for your money because a paper trimmer is an invaluable piece of equipment that will pay for itself in no time. There are two types the guillotine, and the rotary. Guillotine trimmers have a long blade which is pulled down via a handle, and it cuts downwards through the card. They are not suitable for young children to use as they are very sharp, and it's easy for them to pull the handle down with small fingers in the way. Rotary trimmers have a circular blade which rolls through the card. These blades are enclosed, which makes them safer for kids to use. They also have inter changeable blades which will give a fancy edge to your card. Very pretty! Safety and versatility are some of the features you should look for before you buy. And ask some questions too. Is it light enough to carry around should you need to? Is it easy and comfortable to use? Does it give a really good, precise finish to your cards? Are the blades easy to change? And last but not least...COST! A new one on the market is the Purple Cows 2-in-1 Combo Trimmer, that does both jobs in one beautifully designed, combined unit. The trimmer is one side and the guillotine is at the other. The blade to the guillotine is blunt, and so can not harm little fingers. It has a safety shield to hold the paper still while you cut, and it covers the downward action of the blade. The two parts can be separated. They just push apart, which makes it easy to carry around, and makes storage simple too. The rotary cutter part has interchangeable blades that come apart using a "Click blade" system. They are easy to change, and you can purchase seperatly a whole set of different patterned edges, which slot into place with another click. Have a look at this Freestyle Mouse Cutting System. The complete unit is not heavy either, so well worth considering as an addition to your essential crafting equipment. The guillotine handle has a locking mechanism that keeps the handle firmly down for carrying or storing. It was definitely my choice when I needed to buy my paper trimmer.